American poltician, born in Geddes in 1921 but raised in Lake Andes, South Dakota. After graduating from the University of Omaha, he worked for some time with the Universal Finance Corporation, later founding with his wife Exon's Incorporated, an office equipment company. After this business became successful he served as State Vice Chairman of the Nebraska Democratic Party. He served two terms as Governor, and then became the first in that position to be immediately elected to US Senate. 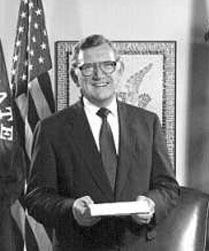 Among his accomplishments in the Senate was authorship of the dubious Communications Decency Act, an unconstitutional law which was almost immediately overturned. It marks one of the greatest attacks on free speech in the modern era. Exon suffered from an unnamed cancer, and was presumably in remission when he died in Lincoln, Nebraska, in 2005.